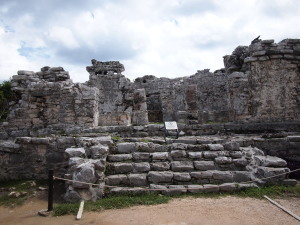 Aside from Chichen Itza there are so many other Mayan ruins in Mexico, unfortunately limited time meant that I had to pick only a couple to see. The two I chose are not necessarily the most impressive, I’m told Palenque and Coba are definitely worth a visit, but they were both a little different. Rather than the huge pyramids like El Castillo, Ek Balam took me into the jungle and Tulum to the sea cliffs. Just a short ride from Valldolid, Ek Balam is a little more challenging to get to then it really should be. There are collectivoes (share taxis) that take people from town to the site for about 50 pesos (US$3.50), the only catch is that you have to wait until there are at least four people before the collectivo will go. As I was there in the off-season, after about an hour it became apparent that no one else was going to turn up any time soon, so my choice was to not go, walk or pay 140 pesos and get there quickly. I chose the latter and was soon on my way. Ek Balam is a much smaller complex than the others I saw in Central America, but that’s part of its charm. Walking through the initial ruins, wasn’t impressive but it sure was quiet compared to the throng of tourists at Chichen Itza. The real reason to visit Ek Balam is the magnificent tower that is hidden by the jungle. The tower is a sculptural feat, with detailed stonework depicting Mayan scenes. Scaling 30 metres in height, it is quite incredible to imagine how on earth this was created thousands of years ago. While tourists can still climb to the top of the tower, my fear of heights prevented me. I’m told the view from the top looks over the dense jungle and is quite stunning. Given that this was once a sacrificial place where priests practiced blood-letting, I suspect the isolated venue was preferable to hide the screams of those who were giving themselves to the gods. Luckily my journey out of Ek Balam was a little easier than the one in. Three of us were in line for a collectivo and we chose to count our blessings and pay a little more to get to town, rather than waiting in hope that a fourth traveller would turn up. Next up was the beachside ruins of Tulum. Being a Cancerian I gravitate towards the ocean, so I couldn’t resist visiting Tulum. 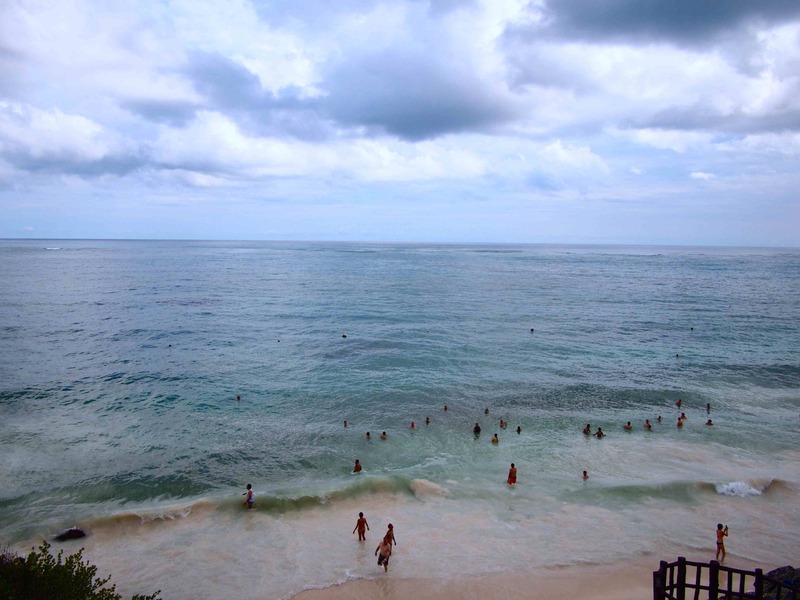 A couple of hours east of Valldolid, and just near Cancun, Tulum is a quintessential backpacker town. There’s lots of bars lining the streets and tourists wandering around in not much more than they swimming trunks, but the ruins are the real star here. Set on the cliff tops overlooking the stunning turquoise Caribbean Sea just walking into the Tulum ruins is a joy, the long path is shaded with huge palms and the scent of the ocean beckons. While the ruins themselves aren’t the most spectacular I saw, the complex is just lovely and it’s easy to spend a few hours here. It is believed to have been named “The City of Dawn” as it faces the sunrise, a sight I wish I had seen. Given how beautiful it is, it’s not surprising that Tulum has been immortalised recently in the video game Assassin’s Creed IV (I’m now hunting down a copy of the game! The ruins are now home to hundreds of iguanas who seem relatively undisturbed by the humans who traipse across their terrain. How many can you find in this picture? Tulum is a fortified site, and while hurricanes and sea salt have left their mark on many of the buildings, you can still see why the Mayans chose to settle here, this is believed to have been on of the last Mayan cities. I found myself a seat and just sat on the cliff top watching the ocean for about an hour. Below me, throngs of tourists took a refreshing dip before scaling the steep stairs back up to the ruins. After all, it’s not every day you can swim below ruins that have stood the test of time for hundreds of years. While, along with Chichen Itza, these were the only Mayan ruins I had time to see in Mexico, I still had one of the major Mayan treasures of Central America left to see… Tikal.